On a daily basis, we experience stress. Stress is that feeling of “Oh my gosh, I’m going to be late!” or “I’m never going to get this done on time!” We all know that feeling in varying degrees. On some days, a car accident or our child breaking a bone takes that daily stress to a new high. But overall, we cope, perhaps with a glass of wine, a bubble bath, or an early bedtime. The next day, we get up and do it again. By then, we are no longer reminiscing about yesterday’s stressors–unless you are continuing to handle the stress of yesterday–and you are able to focus on the next major task or event of your life, positive or negative. That is your good, old experience of stress. You feel overwhelmed in the moment, you are done with it, and you move on. So, when does good, old stress become Post Traumatic Stress Disorder (PTSD)? PTSD is related to a traumatic event (such as a shooting, abuse) either directly or through indirect experience (such as social workers who work with children who are sexually or physically abused). The experience of stress or thoughts about it remain relatively constant, taking very little break if any at all. This kind of stress impacts a person’s ability to make decisions, focus, and complete daily tasks. The individual suffering from PTSD can be agitated, hypervigilant, or even angry. Their stress also impacts appetite (stress eating or no/low appetite), sleep, interpersonal relationships, and ability to manage daily tasks like grocery shopping or managing bills. 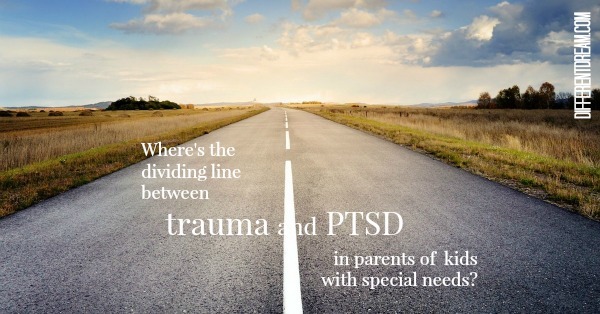 Parents of children with special needs who have been traumatized by their journey in gaining a diagnosis, seeking treatment, participating in treatment, and managing daily behaviors and struggles can develop PTSD. When parents feels stuck, hopeless, helpless, and burned out their stress has developed into PTSD, and it’s time to seek help through a psychologist, support group, or psychiatrist. Does Liz’s information bring to mind new questions about special needs parenting stress, trauma, or PTSD? If so, you’re invited to leave them in the comment box for Dr. Liz to consider answering in future installments of this series. To learn more about Dr. Liz and her practice visit www.psychedconsult.com for more information. Is it possible to have partial ptsd related to special needs? My sons disease was caused by a virus during pregnancy, the one time you feel like you have absolute control over a childs protection. Since his diagnosis amd the information thereafter, finding out friends and family are expecting terrifies me.